The Oscar nominations were announced earlier today. And here’s my quick reactions. ● Three of the 5 Best Picture nominees are among my 10 Best for the year, and 1 of the 2 that aren’t heads my list of runners-up. 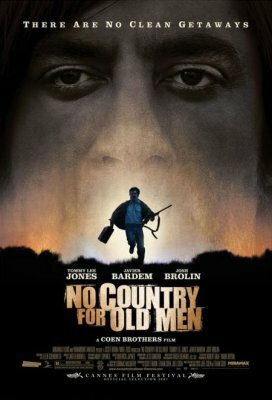 Four of 11 — NO COUNTRY FOR OLD MEN, ATONEMENT and THERE WILL BE BLOOD, plus JUNO. And of the other 7 favorites of 2007, 3 are foreign films that one cannot expect to be top dogs at the US industry honors (which is what the Oscars are). And while I don’t think the fifth nominated film (MICHAEL CLAYTON) is that good (5 grade), it’s no CRASH and I don’t think it’s considered widely to be a front-runner to win anyway. So I am almost guaranteed to be reasonably happy on Oscar night — the Best Picture winner is near-certain to be a worthy film. My tastes are not the Academy’s and I don’t discriminate against comic clowning (see the film at #2 this year), small-studio/indy films and foreign films. In fact, this has never happened. I did a quick glance over the Best Picture nominees for the last 20 years earlier today, and found that that never in the entire period where I can say I have followed movies closely had 3 of my Top 10 been nominated for the Best Picture Oscar.¹ In most of those 20 years prior to today, it’s been 0 or 1. Depending on how you slice my lists, the 100 films nominated for Best Picture Oscar, just 22 (or 24 … see footnote) have grabbed one of the 200 available slots on my 10 Best list — an average of barely 1 per year. So I congratulate the Academy on my tastes. I hope it’s simply that the best English-language films of the year so clearly declared themselves, that there was no denying them. But undoubtedly part of the reason is that some of the fall prestige or semi-blockbuster films that might have looked like potential Oscar-Baition™, fizzled at the box office and/or generated poor or little critical buzz. After all, it’s not as if the Coen Brothers and PT Anderson have been big AMPAS locks in the past (this is only Wright and Reitman’s second films). I’m thinking most of THE GOLDEN COMPASS and the ELIZABETH sequel, and to a lesser extent SWEENEY TODD and BEOWULF, plus such potential breakout films as BEFORE THE DEVIL KNOWS YOU’RE DEAD and all the anti-war films, from RENDITION and LIONS FOR LAMBS to REDACTED and GRACE IS GONE. ● PERSEPOLIS received ample compensation for its snub in the Foreign-Film race (more on that below) by getting a nomination for Best Animated Film. It’ll lose to RATATOUILLE, of course (not that I’m saying that would be a travesty of judgment). But the nomination at this moment will help PERSEPOLIS, since it was released just a couple of weeks ago in the top few cities and is now spreading around the country. I hope Sony Classics has gold-statue emblazoned posters ready. This is a case of the principal reason the Oscars matter to me … as a way of raising the public profile of small films (even small English-language films) that are good enough and accessible enough to satisfy a broader audience than the one that habitually keeps abreast of such movies. 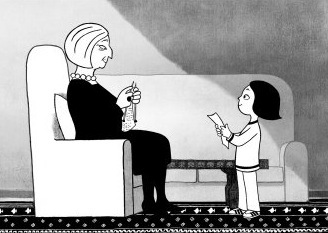 PERSEPOLIS is such a film.